Our Inside Axon blog series is updated every Wednesday and features letters from executives within Axon. This week's post was written by Carol Ann Janca, our Executive Engagement Manager. Check again next week for more experiences and insight from Axon leaders. Whenever anyone says to me, ‘Can I be frank?’ my response is almost always, ‘Only if I can be Shirley’. Seriously, what kind of question is that? If I said, ‘Um, I'd prefer it if you just lie and tell me only what I want to hear’, I think the questioner would look at me as if I had two heads. But how many times do we actually lie in the workplace? Now, I'm not talking about blatant dishonesty like falsifying documents or misrepresenting a product to close a deal. I'm referring to those ‘social lies’ or omissions of truths used to avoid conflict or hurting someone's feelings. An oft-cited study by Robert Feldman at the University of Massachusetts found that 60% of adults lied at least once during a ten-minute conversation and told an average of two to three lies. For us, that would mean in our average 60-minute Leadership Team meeting of 13 people, there is potential for 117 lies to be told! Not exactly the most productive way to have a meeting. Fortunately at Axon, one of our six Values is Expect Candour. We define that as ‘Deliver with respect; assume positive intent’. It is not licence to be an idiot or another seven-letter adjective, nor do we want to ignore the need for confidential or anonymous communications during sensitive situations. Sometimes what is being delivered is a brutal truth, but what sets candour apart from rudeness is the relationship. Our relationships are mission critical. And since our mission is to Protect Life, we really can't afford to tiptoe around our colleagues so we don't hurt their feelings. If something – or someone – is not working, that needs to be communicated. To create a culture of candour, we need people who are willing and able to speak up, often in meetings with senior leaders, and people who are open to honest feedback. Of course, there are people who always speak up. But I'm talking about the people who are quiet in the meetings but snide with buddies at the coffee machine afterwards. Or worse, the anonymous Internet job reviewers who aren't shy about voicing their opinions online but never speak up where it counts: here. One of the cool things about our value of Expect Candour is that it has helped open the door for people to speak up where they might have felt awkward before. I have heard, ‘In the spirit of candour...’ in conversations and meetings countless times. 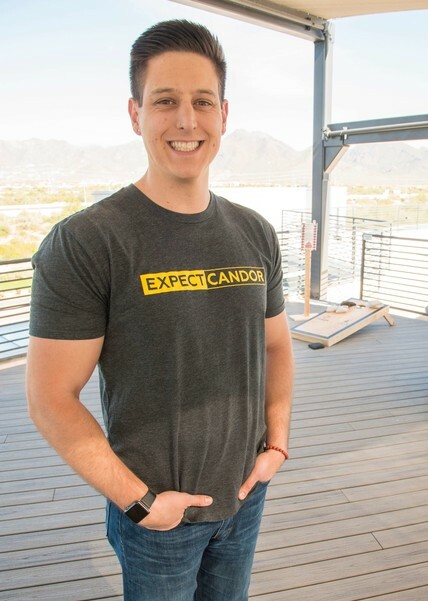 Axon employee Kevin De Rosa sporting our Expect Candour shirt. At Axon, we have t-shirts with individual values printed on them. The Expect Candour t-shirt was somewhat polarising: people either didn't want that one at all or clamoured for it! I have seen people point to their chests proudly and say, ‘Hey, what did you expect?’ after laying out a piece of truth. Of course, ‘laying out the truth’ has to be done respectfully. That's where the relationships come in. As I mentioned before, we don't believe that being candid with each other means we all get to be blunt savages. How would you want someone to speak to you? We don't all have to be friends and hang out when we're not at work, but we do have to get the work done. So we can't be idiots when giving feedback or speaking up; we have to care about the relationships. Building a culture of candour also means that those on the receiving end of it take it in their stride. I was recently told that I displayed a bit of ‘attitude’ in a meeting, and the person did not appreciate it. I was taken aback, but also mortified because that was not my intention. Yet this is a perfect example of how candour should work. The feedback was delivered respectfully. And while the person was not happy, it was not about just them; it was also about me growing and developing professionally. While the feedback was not easy to hear, I know the person's intentions were positive and that we respect each other and our relationship. So we cleared the air and got back to work. And that is why we are all here: to do the work needed to accomplish our mission. As we grow and continue to foster this culture of candour, expect more great things from Axon. I can't say we have mastered candour just yet, but it is amazing to watch our progress. Open, honest and respectful dialogue breeds more willingness to take risks, a higher level of creativity and increased employee engagement. And when you're out to Protect Life, those are game changers.